"Therefore, more blessed are ye, for ye shall never taste of death; but ye shall live to behold all the doings of the Father unto the children of men." As one of His last acts in the New World, Christ gave his twelve disciples an incredible opportunity. He asked them what they wanted from Him before He ascended to the Father (3 Nephi 28:1). Most of them said “that after we have lived unto the age of man, that our ministry, wherein thou hast called us, may have an end, that we may speedily come unto thee in thy kingdom” (v. 2). But three of the disciples said that they wanted to live until Christ’s second coming, continuing to preach the gospel (v. 9). Christ granted their request (3 Nephi 28:9), and the three continued to minister on earth.1 Mormon and Moroni give detailed specifics about these three disciples, generally known as “the three Nephites,” even detailing the number of times they were thrown into furnaces, prisons, or dens of wild beasts (v.19–22). One might wonder where Mormon and Moroni got such specific information about the lives of these disciples. It is likely that some of the information about them in the Book of Mormon came from interviews between Mormon and Moroni and the three disciples themselves.2 After all, Mormon said, “I have seen them, and they have ministered unto me” (3 Nephi 28:26). Moroni spoke of his experiences with these disciples in nearly the same words as his father: “But behold, my father and I have seen them, and they have ministered unto us” (Mormon 8:11). If Mormon and Moroni had spoken to these three disciples, they could have told him about the trials they had been through, perhaps as a way to relate to Mormon in his suffering. Such an interview would have allowed Mormon to record these events in exact detail.3 They could also provide eye-witness details to historical events from hundreds of years ago, including (most importantly) details about Christ’s Nephite ministry. The three Nephite disciples would have been eyewitnesses to Christ’s coming in the Americas.5 As such, they had personally participated in what was arguably the most important event to take place in the western hemisphere up to that point. The writings of Mormon and Moroni may well preserve for the modern reader bits of information gleaned from interviewing witnesses of the founding event of that dispensation. Grant Hardy, a historian, felt, “It would be wonderful to write about something that happened four hundred years earlier and still have an eyewitness there that you could ask questions of to clarify this or that.”6 One can only assume that Mormon and Moroni would have treasured the words of such eyewitnesses, explaining why they would have preserved the words of and various details about these witnesses. A similar scenario exists at the beginning of this dispensation. Brigham Young, John Taylor, Wilford Woodruff, Lorenzo Snow, and Joseph F. Smith and many others all personally knew Joseph Smith.7 Because of this, their speeches and writings contain bits of information gleaned from interviewing an eyewitness of the founding event of this dispensation: the first vision. In this way, the words of these early prophets, prophets that some modern readers may no longer be familiar with, are a window on the first vision and the events of the early restoration. It may be easy for some readers to take the Book of Mormon and the words of the early prophets for granted. 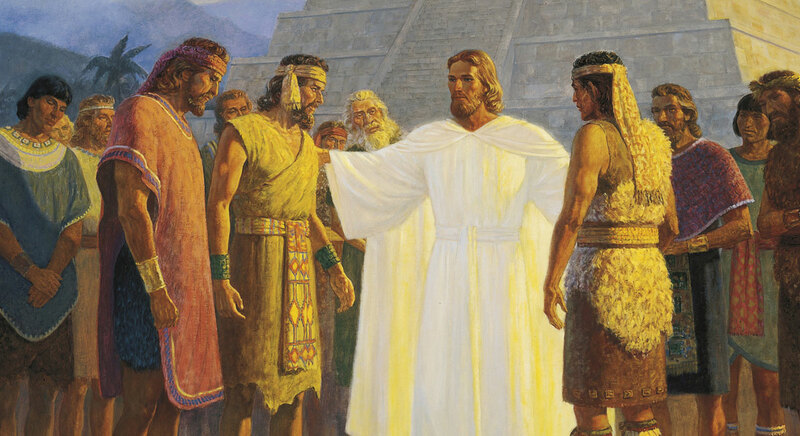 However, many readers of the Book of Mormon and church history would likely also say that they wished they could have witnessed Christ’s visit to the temple at Bountiful or the First Vision. Knowing that the Book of Mormon was written by people who not only had contemporary records but actually conversed with eyewitnesses to the events of 3 Nephi might cause some readers to look at it more carefully as a window into this magnificent event. In the same way, it might also cause some readers to look more carefully at the words of the early prophets, words that allow readers a glimpse into the First Vision, just as Mormon’s words give readers a glimpse into Christ’s visit to the Nephites. Alan K. Parrish, “Nephites, the Three,” in Book of Mormon Reference Companion, ed. Dennis L. Largey (Salt Lake City, UT: Deseret Book, 2003), 610–611. Clyde J. Williams, “The Three Nephites and the Doctrine of Translation,” in The Book of Mormon: 3 Nephi 8 through 30, This is My Gospel, ed. Monte S. Nyman and Charles D. Tate, Jr. (Provo, UT: Religious Studies Center, Brigham Young University, 1993), 237–251. William A. Wilson, “Three Nephites,” in Encyclopedia of Mormonism, 4 vols., ed. Daniel H. Ludlow (New York, NY: Macmillan, 1992), 3:1477–1488. 1. Evidence of their continued ministry can be found in 4 Nephi 1:14; Mormon 8:11; 9:22; Ether 12:17. 2. For more information on how this could be possible, see Clyde J. Williams, “The Three Nephites and the Doctrine of Translation,” in The Book of Mormon: 3 Nephi 8 Through 30, This is My Gospel, ed. Monte S. Nyman and Charles D. Tate, Jr. (Provo, UT: Religious Studies Center, Brigham Young University, 1993), 237–251. 3. Alan K. Parrish, “Nephites, the Three,” in Book of Mormon Reference Companion, ed. Dennis L. Largey (Salt Lake City, UT: Deseret Book, 2003), 610–611. 4. Occasional clarifications like this occurred in other places in the Book of Mormon (such as Alma 24:19), and may be due to the difficulty involved in erasing plates, and thus had to be corrected in the middle of the sentence. See Daniel H. Ludlow, A Companion to Your Study of the Book of Mormon (Salt Lake City, UT: Deseret Book, 1976), 210. 5. William A. Wilson, “Three Nephites,” in Encyclopedia of Mormonism, 4 vols., ed. Daniel H. Ludlow (New York, NY: Macmillan, 1992), 3:1477–1488. 6. Grant Hardy in “3 Nephi Conference Panel Discussion,” in Third Nephi: An Incomparable Scripture, ed. Andrew C. Skinner and Gaye Strathearn (Salt Lake City and Provo, UT: Deseret Book and Neal A. Maxwell Institute for Religious Scholarship, 2012), 377. Hardy was referring to Mormon’s interactions with Jesus, but the principle still applies. 7. Mark L. McConkie, Remembering Joseph (Salt Lake City, UT: Deseret Book, 2003), 62–63, 205–207, 216–218.